I have always been partial to a raw food lifestyle…ever since I tried it out for a couple of months in 2005. I felt incredible and I couldn’t deny the benefits a raw food diet provided. 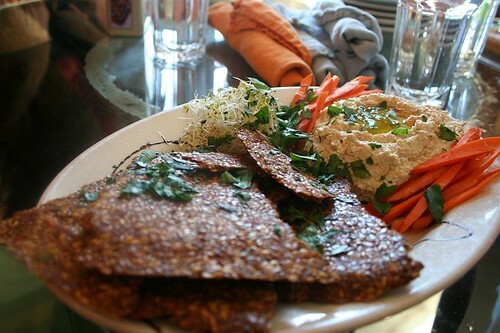 But that first time around, I focused a lot on creating more “gourmet” raw dishes that were heavy on the nuts and fats. I leaned heavily on “transitional” foods that are great to help you get started eating 100% raw, but then I just kept eating them. This just made it hard to continue it because it was expensive, time consuming, and not great on my digestive system. This time around I have discovered a new way of “doing raw” and I couldn’t be happier. It’s about as simple as it gets and is so easy to maintain. The basic idea behind is that you eat sweet fruits all day long…to include smoothies if you like. And for supper, you have a huge green salad with lots of green stuff and veggies…but very little fat. When I would normally make a salad, I would put at least 1/2 avocado, 1/2 cup walnuts, hemp seeds, flax…you name it. Plus, the vinaigrette. VERY high in fat. Being that this time I’m looking to lower the fat content, I only put ONE of those things on my salad per day. 🙂 It’s actually helped me appreciate each one of those wonderful things even more. I have modified my original dressing recipes…cutting way back on the olive oil and adding more water. It tastes just as yummy! In addition to eating whole, raw fruits and veggies, I have added at least one green smoothie a day. I was turned onto this little secret by my friend, Deanna, who sent me the book “Green For Life” by Victoria Boutenko. I had read Victoria’s “Ode to Green Smoothies” awhile back, but never really got into it. I read this book in 2 days and immediately started making smoothies every day. I saw a radical difference in my energy and cravings. The smoothies also contain all the fibers in the fruits/veggies…so it’s a little different than juicing. I’ve been having my green lemonade in the mornings too. Considering I am nursing a toddler, my caloric need to maintain my current weight is between 2,000 – 2,500 calories a day depending on my work out for that day. I usually try to average it out over the week…it can vary per day. I’ve been tracking on FitDay just to get an idea of how much I’m taking in, and I’ve been fine. I wouldn’t recommend tracking every single day (you’ll drive yourself crazy)…use this just to get an idea of what you’re truly eating and where your calories come from. My skin is smooth and glowing. Excess water/bloating has disappeared. I feel light and fit. I wake up alert and energized. I need less sleep to feel rested. My senses are all heightened, especially my sense of smell. I have no cravings (I credit this to the green drinks/greens). Ok, I take it back. I do have cravings…for fruit! I can’t get enough of it. It’s so fun to sit and eat all the fruit I want (combined correctly) until I’m full. Yum. I have started to lose my taste for cooked foods…they just seem so dry and dead! So different than an apple or banana or crunchy greens. My sweat doesn’t smell as much and my breath is sweeter and less rancid in the mornings. I don’t have gas or other digestive problems. I used to just think that gas/bloating was part of being a vegetarian, but now I know that it doesn’t have to be that way. By completely cleaning up the food I eat, my body has reacted very quickly to the exercise I’ve been doing for the last 4 weeks and I’m noticing amazing changes. Another wonderful benefit is the fact that when you are eating so “clean”, you are much more in tune with your body. When you take away everything that is causing you ailments…it’s easy to pinpoint exactly what your problems are. I’ve figured out which foods trigger certain reactions, and know how to avoid them. I am also working on not eating after 7:00 p.m. At first it was difficult, because I am such a night snacker. I love to snack, snack, snack…up until bedtime. But because I’ve been consuming so many greens, I don’t have those cravings anymore. My stomach works on getting everything from supper digested before I even go to sleep…and then when I am sleeping, it can work on healing and replenishing at the cellular level. Going raw has acted as a natural detox for my system too. After all the processed foods we were eating while on the road, my body was craving a clean slate. You can tell a lot about your body by your poop. I can now poop 2-3 times a day…which means that my colon and the rest of digestive system is working wonderfully. If you want to figure out what is up with your body, examine your poop! 🙂 Here is a great post on Rawkin’ about poop. Eating raw foods also has the ability to HEAL many, many diseases including diabetes and cancer. Here is a great video on how it can cure diabetes. Be sure to check out Alissa’s site for many stories of healing. I know the first question you probably have in your mind is “what about protein!?”. The short answer is that it’s completely possible to get all the protein you need from greens, fruits, veggies, and nuts. If you don’t believe me, you may want to check out what the mighty apes eat (fruits, greens, nuts) and how muscular they on a plant based diet. Our protein needs are no where near as high as the dairy and meat industries want you to believe. Plus, plant based protein is processed much differently than when you eat an animal based protein. Here is a bit longer answer on this topic. Overall, I am so excited to have started this again. I feel SO great…and that’s what matters. If I feel like having cooked food, I will make that choice. But it’s a choice. I’m much more conscious of all my food choices and how they affect my mood and my body. Will I eat pizza again? Yes. Will I drink a Soy Caramel Machiato again? Yes. But the majority of my eating will be raw. Will I stop posting yummy vegan recipes on Happy Foody? No. 🙂 Is it hard being around cooked food and yummy smells and all the deliciousness hard? Sometimes. But I honestly crave fresh foods now more than cooked, so it’s really not bad. Plus, considering how fabulous I feel, it would be hard to go back to a 100% cooked diet. Entry filed under: Healthy Eating, Raw. Hey, Sara, our nutrition journies are sort of parallel right now. I finished Dr. Graham’s book not too long ago, but found it sort of difficult to just eat fruit throughout the day. Probably should have transitioned with a little more fat. I’ve become determined to clean up my girls’ diet. And became even more determined when I heard that the WHO is predicting a DOUBLING of cancer rates in the next 15 years because of what children are eating when they are young!!! Can you believe that?? I was totally staggered by that. Does your challenge include juicing? I couldn’t survive without lentils and beans and hummus and tofu! Not to mention quinoa, oats, spelt flakes, barley, millet. I am vegan and eat lots of veggies, fruits, whole grains (not breads), legumes, nuts and seeds. I feel fit and healthy on this eating plan and have maintained my ideal weight for the 24 years of being vegan. I have been doing the Eat to Live plan for a while now after becoming incredibly ill and hospitalized with digestive issues caused from eating meat and cheese. I would love to go raw and your ideas are fantastic. One thing I have to ask is how in the world can you eat so much in one day?! 4 bananas as a snack? Yikes, I would be full if I ate one banana!! LOL. Love your blog! Did I read that right? Do you eat upwards of 8 bananas a day? That’s a lot of bananas!!!! I’m not into the whole raw foods myself but find your post very interesting and like to eat healthy so much of the food still applies. And about the green smoothies-Are they tasty? I guess the only way to find out is to throw some spinach in the blender with a banana! I do wonder, however, if you need to reduce your fat so much-Fat is good for you, especially good fats like avocado, olive oil and nuts. Certainly you can’t be hurting yourself with those on your salad at night. Good luck it sounds like you feel great and I look forward to learning more! Natalie…that’s so awesome. Makes me with I was back in the hood so we could encourage one another in real life!! About juicing…I LOVE my green juice in the morning…it give my body instant access to the vitamins and chlorophyll… but I am trying to make sure I get a green smoothie too sometime during the day. I just feel that there is so much benefit to having the actual fibers from the fruit/veggies intact. I usually do my juice when I wake up and then the green smoothie for lunch. As long as I have something green right away in the morning, my cravings stay away. Email me directly if you ever want to chat!! christie…I think it’s awesome that you’ve been going strong for that long on a healthy vegan diet. You’re WAY, WAY ahead of most people in this country. My main concern with eating a cooked vegan diet is not getting enough green leafies….they make all the difference. So if you’re getting those too, awesome. LisaC and Christine…yes, it’s a lot of bananas! It’s a wonderful, perfect fruit for calories and energy throughout the day. We’ve been “told” throughout our lives that one piece of fruit per sitting/snack is a good thing. But going raw a few years ago really challenged that idea for me and I just started doing what my body told me instead of what my culture told me 🙂 When you aren’t filling your body up with breads and cheeses and other stuff, it’s super easy to eat 3-4 delicious bananas at once. I usually space them out over a few hours…And yes, the green smoothies are delicious! There are so many kinds, so if you don’t like your first attempt, add more fruits and try again! Avocados, nuts and seeds are extremely high in fat content. When it comes to fat, it doesn?t matter so much its origin; fat is fat. Fat goes from the lymph system directly into the blood. Too much fat will thicken the blood, causing the red blood cells to clump together so they cannot deliver oxygen to the cells. Excess fat also blocks the action of insulin in bringing sugars to the cells, which leads to diabetes. It is better to eat small amounts of avocados, nuts and seeds, and not to eat them daily. There is more than adequate fat for the body from fruits, vegetables and leafy greens. Thanks for this great pep talk post. I have been wishy washy about trying to go all raw for a few weeks now. I have been craving the information and trying to read everything I lay eyes on about it. I have read all of your blogs for a long time now and really enjoy them. I’m glad to see that this one is seeing so much more activity now! YAY! (Plus I love your pictures of food…lol) Anywho, I would love any tips you have for a beginner going raw. I don’t have a vita-mix, just a regular blender (Osterizer baby) and my juicer is just a standard issue from the department store, do you think they will work for now? I, like you, would like to save for better appliances, but I thought I should give it a trial run first before making the investment. One question I had for you was that you added “proper combined” to your post about the fruits/food. Can you elaborate? Thanks so much for all this great info, and the great links. I’m reading them all! If it was too sour, you might have had too much lemon…and not enough apple. I usually use 3 small apples or 2 large apples. It should turn out pretty sweet with that ratio. Tell me exactly what ratios you used and I can try to pin point it. This sounds fantastic! I’ve been a vegetarian for several years — but my only concern with a raw diet is the seasonality of raw fruits and veggies. I try to eat as local as possible (to support local economy, to minimize fuel used to ship, etc) and unless you live somewhere like Florida, you’re going to have to rely on shipped foods to eat a diet like this…how do you deal with this? I’d be really interested in eat more raw if it was able to help me reduce my food’s carbon footprint… 🙂 Thanks for writing this! I too I’m very interested in this diet, but would like to stay local with my produce. It will be easy in the summer time, but what about winter? I’m willing to buy out of season produce but would prefer not to. Does your daughter eat a raw diet too? I was curious b/c we want to incorporate some of this into our daughter’s diet. She is 16 months. I worry about her getting enough iron and fats. She is still nursing, but eating a lot more. We thought about giving her a green smoothie a day.